Below are youth / children's saddles for sale on eBay. Please scroll down for an article with tips on what to look for when buying a youth saddle. If you scroll down, you'll find even more youth saddles for sale, this time from HorseSaddleShop.com. A young cowboy in a youth saddle. What are the measurements of the youth saddle? You will probably want to know the seat size, the width of the gullet, and the height of the cantle. You may also want or need to know things like the size of the saddle horn, and the overall length of the saddle. Is the general description of the saddle complete? The seller should describe the youth saddle's finish (roughout, tooled, etc.) and color. They should also describe the rigging, saddle horn (leather covered, horn cap, etc. ), cantle (height, Cheyenne roll, etc. ), seat (padded, hard, etc. ), and stirrups (if any). Below: Photo of a youth saddle. 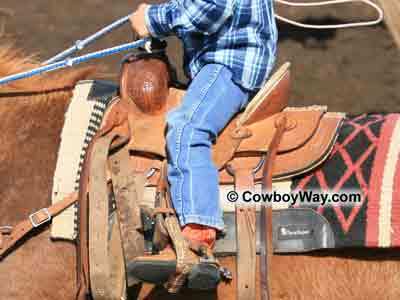 This saddle is a ranch style with a hard seat, high cantle, and double-rigging. What kind of rigging does the saddle have? Is it single rigged (made for a front cinch only), or double-rigged (made to be used with a front and back cinch), in-skirt or out-skirt? How long or short will the stirrups adjust to? Sellers may describe this something like: "From the center of the seat to the bottom of the stirrup is X inches, and can be adjusted up or down." Is the saddle made to fit a horse, or a pony or miniature horse? Does the seller describe the tree in the saddle (semi-quarter horse tree, pony tree, etc.)? What type of saddle is the youth saddle? Is it for general riding, roping, barrel racing, etc? Is there at least one excellent photo of the saddle? Is the youth saddle new or used? Children can outgrow saddles quickly, so a used youth saddle for sale might offer you a good deal on a not-too-used saddle for a good price. If the youth saddle is used, how used is it? Does the seller describe any scratches, scuffs, tears, etc.? Is there at lease one excellent photo of the saddle? If the seller describes any damage to the saddle is this shown in the photographs? Is the fleece underneath the saddle in good condition? If you do not feel the seller is showing enough photographs of the saddle, ask them for more before you bid or buy. Does the youth saddle come with or without cinches, stirrups, latigos, billets, a breast collar, etc.? It would not be unusual for a youth or adult saddle to come with or without any of these items, so you should know exactly what you are, and are not, getting. What is the saddle made of? For example, it could be made of leather or some type of synthetic material such as Cordura of Equileather. What will the shipping charges be? Remember, even a children's saddle can be heavy to ship. Make sure you know what the shipping charges are before you bid on or buy the saddle. Will the seller ship to your area? How soon will the saddle be shipped after you pay for it? What payment methods does the seller accept? How soon after the sale do you have to pay for your purchase? An increasing number of eBay sellers are getting tired of buyers who take a long time to pay for their item. Some of these sellers are now requiring the item be paid for within a certain time frame or the sale is off. Read the item's description for acceptable payment times and terms. If you don't like the saddle after it arrives, can you return it? Be sure to check the seller's return policy. 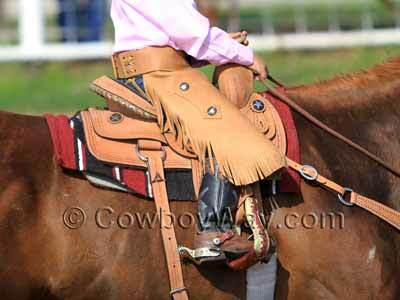 If you have any questions on a youth saddle be sure to ask the seller before you bid or buy. Look for the "Ask a question" link in the "Questions and answers about this item" area to ask your questions.